Luxurious rare apartment with a garden, in the exclusive Giudecca Island. Important art masterpieces surround you while breathing the quiet atmosphere of the island. 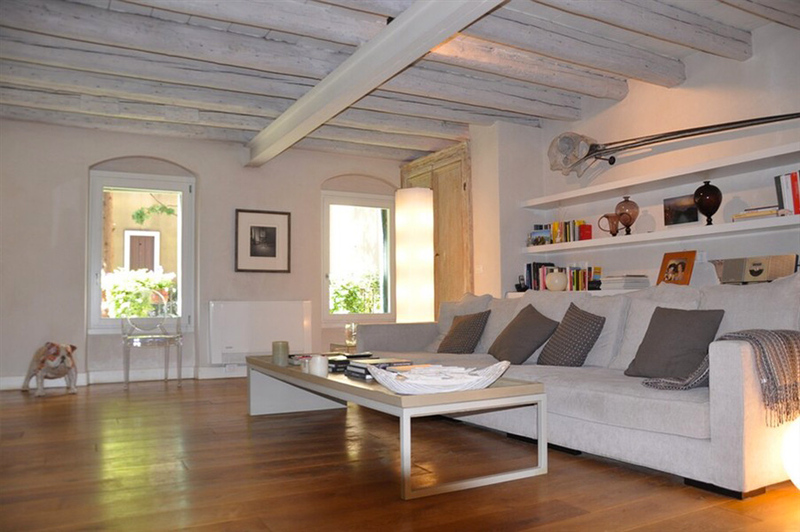 Byzantine is a luxury apartment located in Giudecca, the closest and most serviced island in Venice. It’s a 90 sq.m. apartment elegantly furnished and supplied with all comforts, a wide and elegant living room with wood floors and ceilings, a fully equipped modern kitchen with a crystal dining table and a large wine cellar, two silent bedrooms and en-suite marble bathrooms. It can host up to 4 guests. Bright and magnificently furnished, Byzantine is characterized by artworks like the travertine column made by the sculptor Girolamo Ciulla and the skull of a bird realized by Quentin Garel, one of the most promising international sculptors. Byzantine is in a green area facing the sea, giving perfect relaxing moments to the guests who want to spend some time in one of the most beautiful cities in the world. Right next to the property is the famous Harry's Dolci, where you will have a nice discount! The building is 50 meters walking from Palanca stop and few minutes by vaporetto (waterborne) from Saint Mark's square. Giudecca was historically an area with wide gardens. The island became an industrial area in early twentieth Century, with shipyards, factories and a film studio. Much of the industry went into decline after the Second World War, but it is now regarded as an exclusive residential area, known for its long dock and its churches, including "Il Redentore" (La Basilica del Santissimo Redentore). Giudecca Island is today the favourite destination of Venetian young couples, tourists and artists. Its quiet atmosphere will pervade you. Below you will find useful links and directions to reach Byzantine Apartment, depending on your transport type you can choose the best way to arrive at the apartment. Take the bus nr. 5 and get off at Piazzale Roma (end of the journey). From there take the waterborne (vaporetto) nr. 2 and get off after about 25 minutes at Palanca. Take a taxi to San Basilio, then the waterborne (vaporetto) nr. 2 St. Mark's Square direction (left dock) and get off after 2 stops at Palanca. Take the water bus (vaporetto) nr. 2 and get off after about 20 minutes at Palanca. After 23:00, the waterborne nr. 2 runs every 25 minutes. Giudecca Island is about 5-10 minutes far away from St. Mark's Square.